Our first challenge of the new year coincides with my dad’s birthday. Our family tradition is for my mom to make chicken paprikas to celebrate the big day. It’s always a special occasion, because she makes it exactly once a year. Why? As delicious as it is, it’s not the healthiest dish in the world. Her recipe calls for a dozen eggs, plus sour cream, and butter…definitely not a low-calorie or low-fat meal. Chicken paprikas is a traditional Hungarian stew that usually incorporates chicken, onions, butter, paprika, and sour cream. Many recipes also call for tomatoes and green bell peppers, though my mom has always left these ingredients out. My family has Hungarian roots, and this recipe has been passed down through the generations, so I have no doubt about its authenticity. (Or its flavor: it’s mouth-wateringly good). 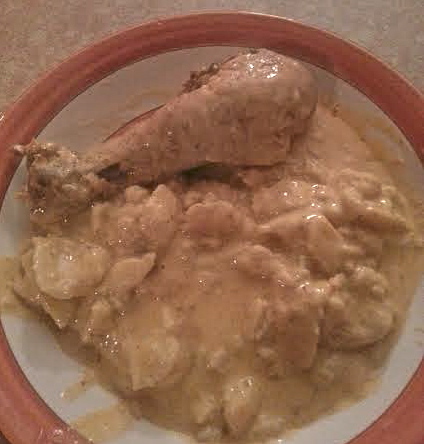 Chicken paprikas (pronounced, and sometimes spelled, paprikash) is traditionally served with dumplings. 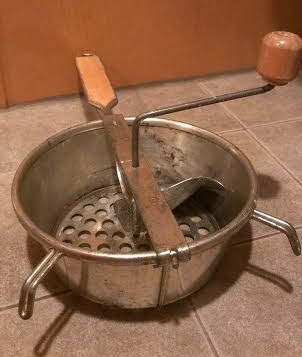 We use old-fashioned metal dumpling makers to make ours. My dumpling maker. This once belonged to my grandmother. True to its name, the most important ingredient is paprika. 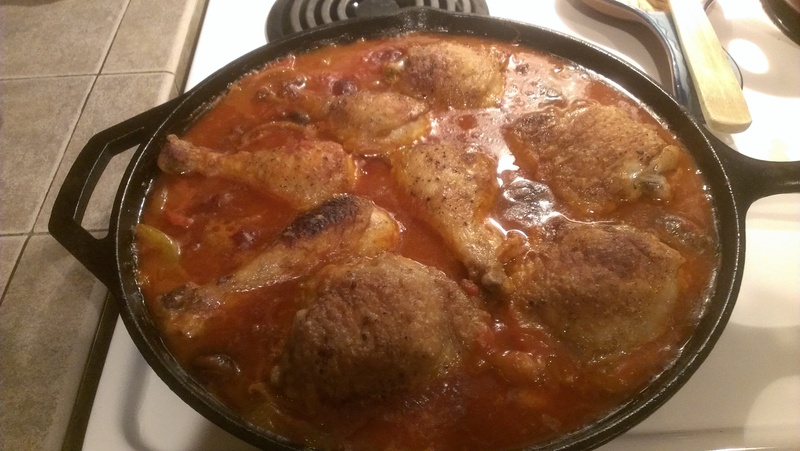 And it’s got to be Hungarian paprika – a nice combination of sweet and pungent. I never buy any other type. (Shout out to my ancestors!). Recipes such as this were meant to be passed down. I like to think my grandkids’ grandkids will be enjoying this same dish 50 years from now. It’s not particularly complicated to make, but it is time-consuming. My lone attempt, about ten years ago, resulted in dumplings that were thinner and not quite as flavorful as my mom’s. 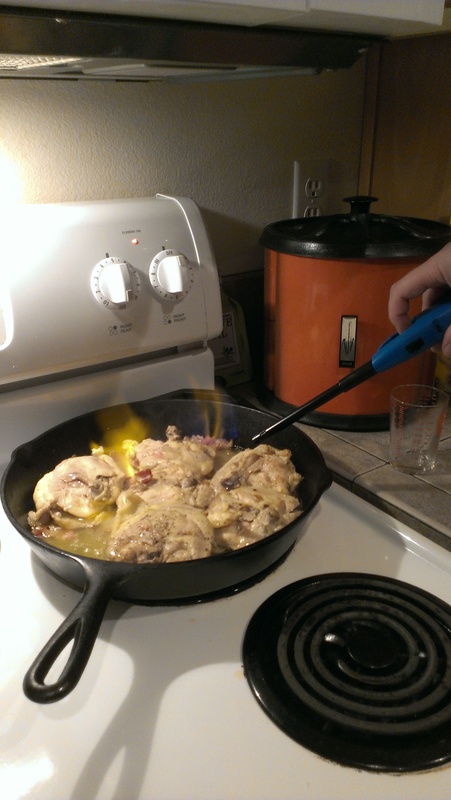 So for this food challenge, Tara wanted to see if she could replicate my family’s famous chicken paprikas recipe. How’d she do? Let’s hear it from her! Well, according to everyone’s slurping and munching at the dinner table, I did pretty well. I absolutely adore my mother-in-law and was looking forward to having her teach me this family dish. 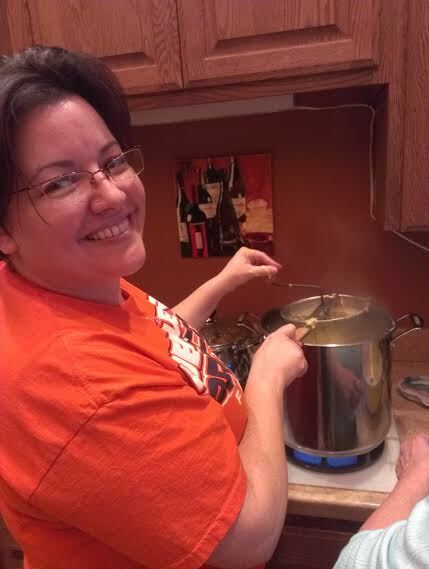 I chopped onions while she threw butter into the pots. I seasoned the chicken thighs and legs while she told me not to use too much pepper. And then I beat the dozen eggs and too slowly added flour until the dumpling batter reached the right consistency; halfway between pancake batter and a quick bread dough. She poured the batter while I cranked the dumpling maker. The dumplings (similar to spaetzel) cooked in boiling water and then were later added to the sauce. The sauce came together quickly after removing the stewed chicken and straining the onions. The reserved cooking juices were combined with equal parts sour cream and water…and another egg. The dumplings were added to the sauce and brought to a boil. Yes, labor intensive, but not as bad as I thought it would be. Not anymore so than my mom’s Chicken ‘n Noodles or Chicken Chimichangas. The flavor is wonderful and definitely worth all the hard work. The real test will be when I make it without Carol’s guiding hand. I ‘m looking forward to getting the recipe down pat, and passing it on to younger generations! We all agreed, the paprikas turned out fantastic. And trust me, we’re tough critics when it comes to this dish! Job well done, Tara. 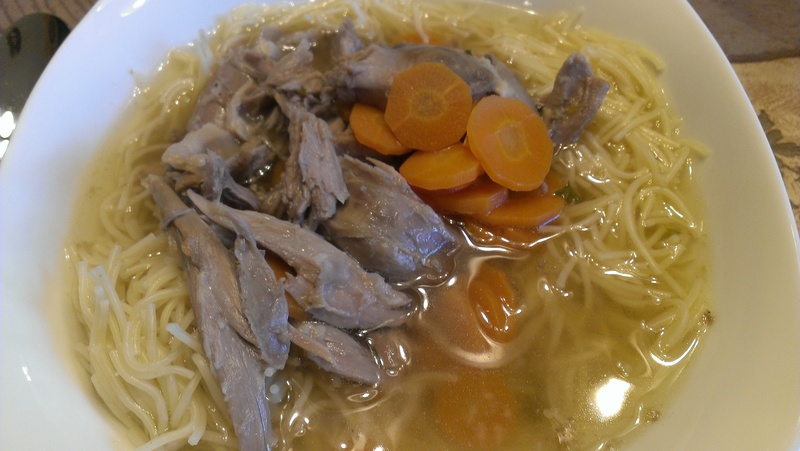 You singlehandedly – and easily – accomplished the first of this year’s food challenges: recreating a favorite family recipe. You might come to roux this day if you miss out on the food du jour. October 12 is National Gumbo Day! Gumbo is a thick stew that contains a rich stock, meat and/or shellfish, a thickener, rice, and vegetables. It is as synonymous with Louisiana as jazz, the bayou, and Mardi Gras, and is the official cuisine of that state. No wonder: it originated in southern Louisiana in the 18th century, when slaves arrived from West Africa. They brought with them recipes featuring ki ngombo, or okra, many of them stews served with meat and shrimp. By 1764 they were mixing these stews with rice to make a hearty meal. 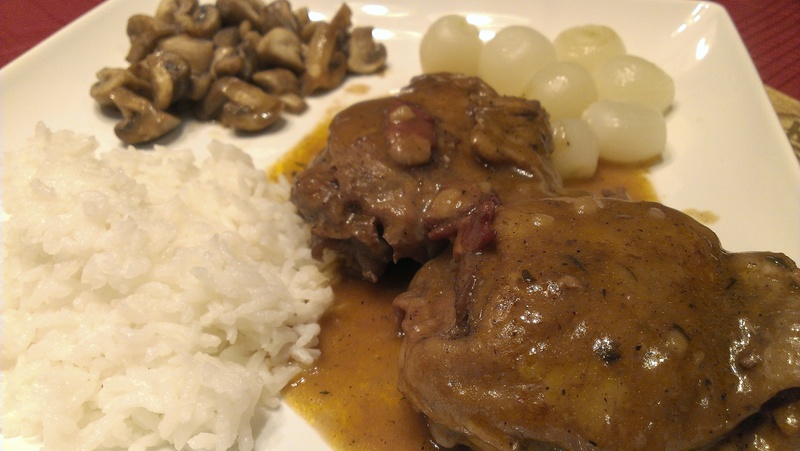 Most gumbos are thickened with a roux, a mixture of flour and oil that is a staple of French cooking. The local Choctaw indians utilized filé powder, made with ground sassafras leaves, as a thickening agent in place of (or in addition to) a roux. Interestingly, the Choctaw word for sassafras is kombo, leading many to speculate that the dish actually originated with Native American tribes in the region. Whether it is Creole, Cajun, Indian, or African in origin is open for debate. Over the years, German immigrants introduced sausage to the recipe; fishermen supplied oysters, shrimp, and crab; and Canary Islanders brought a fondness for strongly seasoned foods to the table, introducing cayenne pepper. Virtually anything could be added to a pot of simmering gumbo: there are even references to owl, squirrel, and muskrat. The first written record of gumbo dates to 1803, where it was served at a gubernatorial reception in New Orleans. The dish’s popularity was limited to the Gulf Coast region until the 1970s, when Louisiana Senator Alan Ellender began cooking gumbo for his colleagues, including 5 separate U.S. presidents. When he passed away in 1972, the Senate added Louisiana Creole Gumbo to its cafeteria menu in honor of Ellender. Popular Louisiana chefs such as Paul Prudhomme and Emeril Lagasse further popularized gumbo, turning it into a mainstream meal. 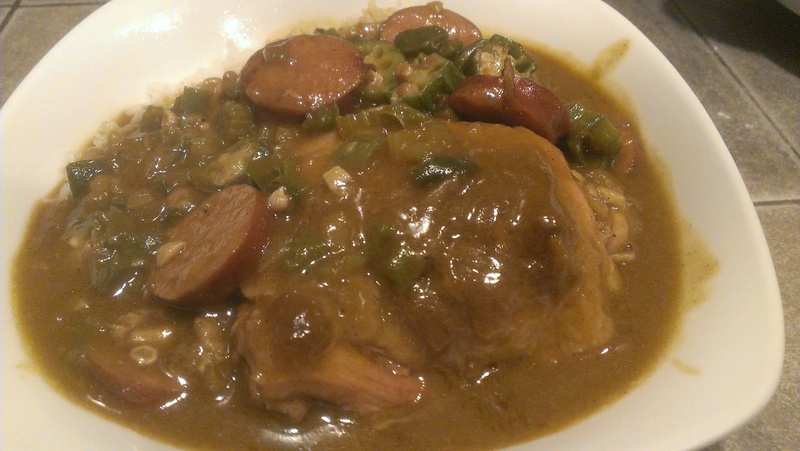 To celebrate, I decided to make a gumbo from scratch. This is no small feat, but on a cool and damp Saturday afternoon and with Tara recovering from a cold, it was the perfect opportunity to make a nice slow-cooked meal. I’ve made gumbo a couple of times in my life, but previously, I used a jar of roux a friend in Louisiana had sent my way. Unfortunately that jar was long gone, so I had no choice but to make my own roux. That alone is a 45+ minute process, but I was pleased with the results. I used a recipe from Donald Link’s Real Cajun cookbook, one of many I own from my days as a book reviewer. I deviated from the recipe in places, namely the roux, and the fact that it called for fried chicken but I just wanted to brown mine. Everything else was the same – the vegetables, seasonings, andouille sausage, etc. And I have to say, it turned out delicious! I was very pleased with the results, especially considering the fact that I’ve rarely ventured south of the Mason-Dixon line. Some people like breasts. Others prefer legs. I’m a thigh man myself. Before you call me a pervert, relax – I’m talking about today’s food holiday. July 6 is National Fried Chicken Day! Fried foods have existed since the Middle Ages, when they were known as fritters. Almost anything was breaded and fried back then, including meat, seafood, and fruit (but sadly, Twinkies wouldn’t hit the deep fryer for another 500 years or so). The Scottish traditionally deep fried chicken, whereas their European counterparts were more likely to bake or boil theirs. When Scots immigrated to America and settled in the southern U.S., they brought along their favorite fried chicken recipes. African slaves who worked as cooks took a liking to fried chicken, mainly because plantation owners allowed them to raise chickens, which were cheap and plentiful. They added their own spices and seasonings to “kick it up a notch,” as Emeril is fond of saying, and fried chicken soon became a Southern staple, often served on special occasions. The invention of the cast iron skillet and the growing use of lard as a byproduct of hog rendering plants helped spread the popularity of the dish. In 1930, a service station owner in Corbin, Kentucky named Harlan Sanders began cooking and serving fried chicken, ham, and steaks for his customers. His dishes became so popular he opened a restaurant in a nearby motel and, over the next several years, perfected his “secret recipe” for frying chicken in a pressure fryer, with a blend of 11 herbs and spices. In 1949 his friend, the Governor of Kentucky, recommissioned him as a “Kentucky Colonel” and soon after he began wearing his distinctive trademark white suit and string tie, and grew a mustache and goatee which he dyed white to match his hair. Quite a fella, the Colonel, but it’s hard to argue with success: in 1952 he franchised Kentucky Fried Chicken and became a very rich man. KFC was instrumental in helping to launch fast food fried chicken chains. In honor of the holiday, I wanted to make my own fried chicken. I have a recipe that’s both tried and true and tastes excellent. But we were on the go all day today, hiking up near Mount St. Helens. We got home late in the afternoon and didn’t feel like going to all the trouble of making from-scratch chicken…not when there was a Popeye’s a few miles away willing to do all the dirty work for us! 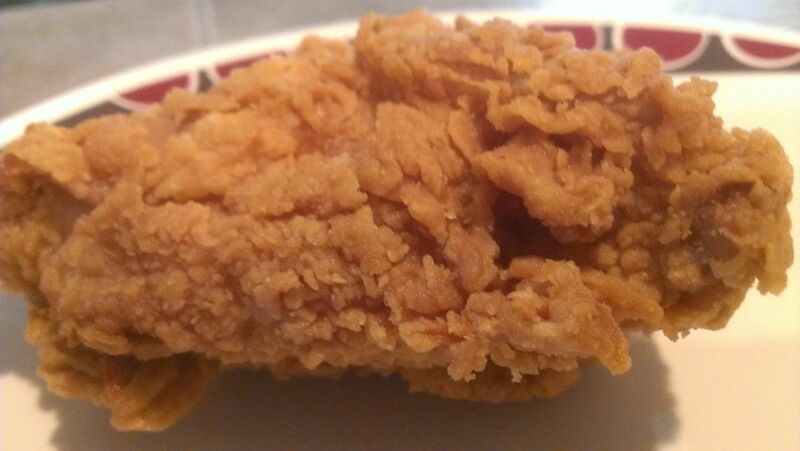 I guess we should have opted for KFC since I wrote about them here, but I’ve long thought Popeye’s serves better chicken. June 3rd is everything it’s cracked up to be, and that’s no yolk. It’s National Egg Day! National Egg Day is one of the oldest food holidays in the world. It was first declared a holiday by Roman emperor Claudius Nero Germanicus during his reign between 41-54 A.D. A poultry plague devastated Europe at the turn of the century, and people were afraid to eat chicken and eggs. Claudius was convinced eggs were safe and challenged nobles in his realm to eat them in order to prove to the peasants they were harmless. Augustus Antonius took the emperor up on his offer, and ate a meal of boiled eggs before a large gathering. He did not keel over and die, and the Roman population once again embraced eggs and poultry. Claudius issued a royal proclamation declaring June 3rd as the Holy Roman Day of Eggs. The holiday was celebrated for 500 years but eventually faded from memory. In 1805 Napoleon captured historical Italian documents of the Roman Empire. Reading through them, he was intrigued by their fondness for eggs, and in turn declared June 3rd to be “Oeuf Journée Nationale,” or National Egg Day. It has remained popular ever since. 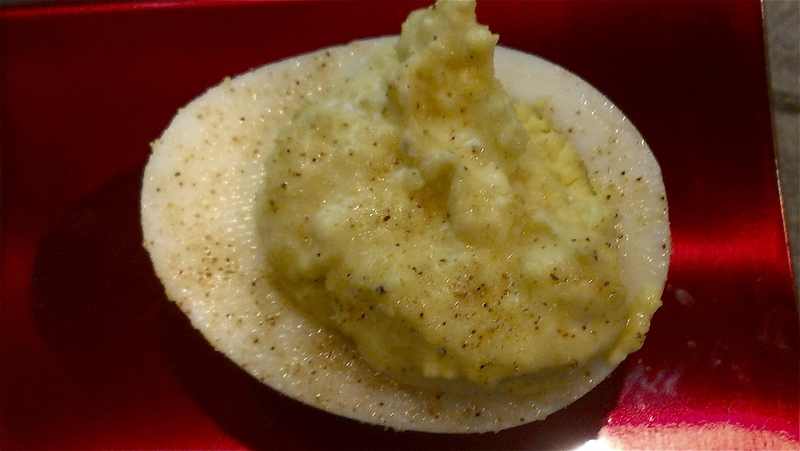 Tara suggested we make deviled eggs to celebrate, and I thought that was a great idea. 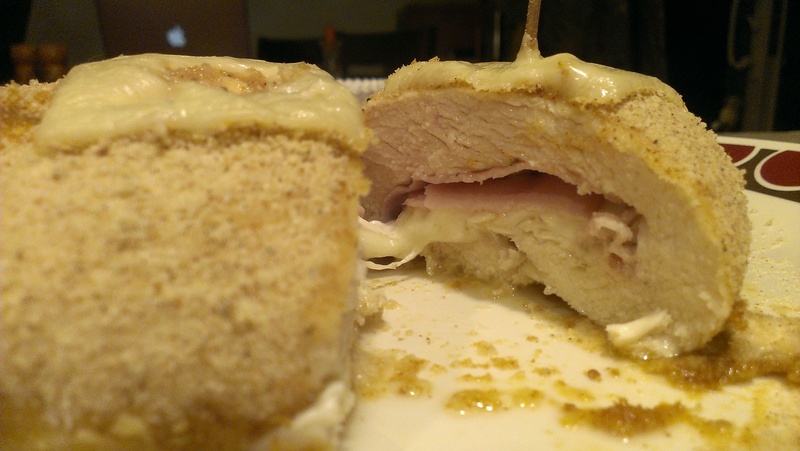 They’re delicious, simple to make, and usually reserved for special occasions. I think both Napoleon and Claudius would be proud. Tara’s got a special recipe, and will take you through it step-by-step now. I got the inspiration for this post from a previous blog entry written in 2008 that shows step by step instructions. 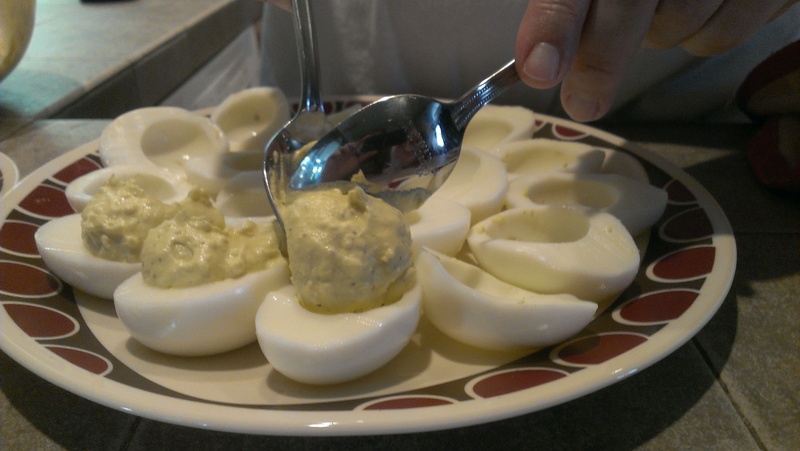 At the time, I had an online/blogger friend in Australia that had never seen or tried deviled eggs and I was convinced that she had to have some. Since pictures are always fun, here we go again! This time I started with a dozen eggs (+1 that was rolling around from our last carton) that I let boil for about 35 minutes. They were cooled in cold water, peeled, and paper towel dried. Each egg is cut lengthwise; the whites arranged on a plate, and the yolks mashed with a fork in a bowl. 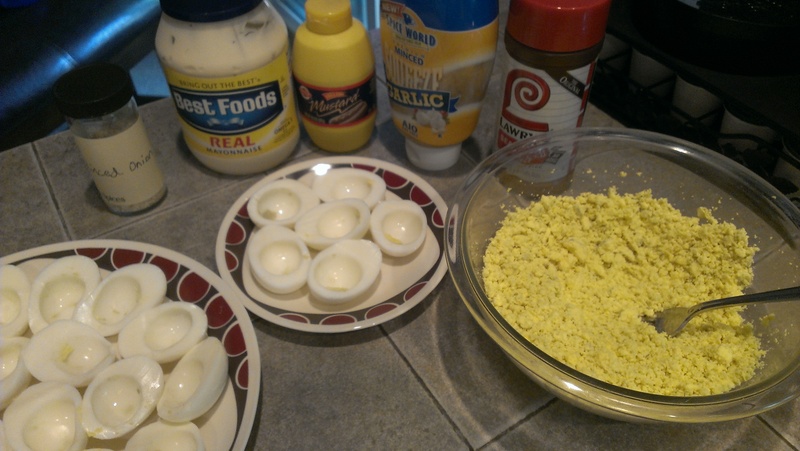 I then laid out the mayo, mustard, diced onion*, garlic, pepper, and Lawry’s seasoned salt. Unfortunately, I can’t give exact measurements on ingredients. It really depends on your taste and how many eggs you actually end up with. I don’t know about you, but I always end up with at least one or two eggs that don’t peel right and end up in the trash. 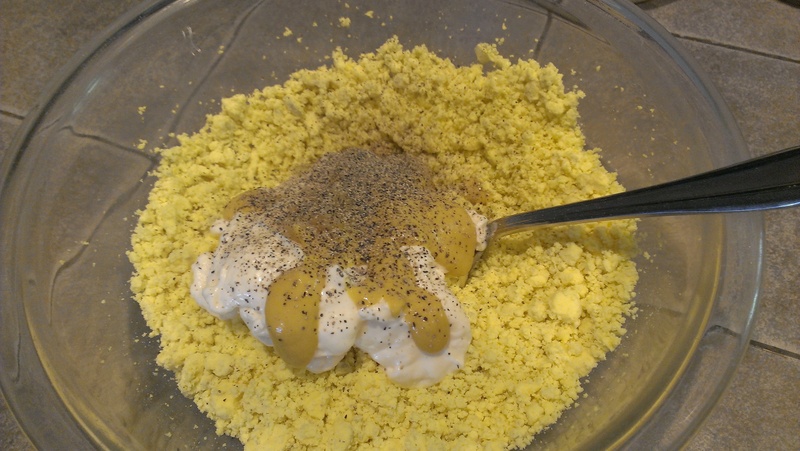 Rough measurements are… two-three heaping tablespoons of mayo, squirt of mustard, ¼ finely diced small onion, 1-2 cloves minced garlic, and five or six shakes of pepper. I blend the yolk mixture, taste, and add any of the above ingredients as needed, and then spoon the filling into the egg whites. Did you catch that the seasoned salt WASN’T added to the filling? 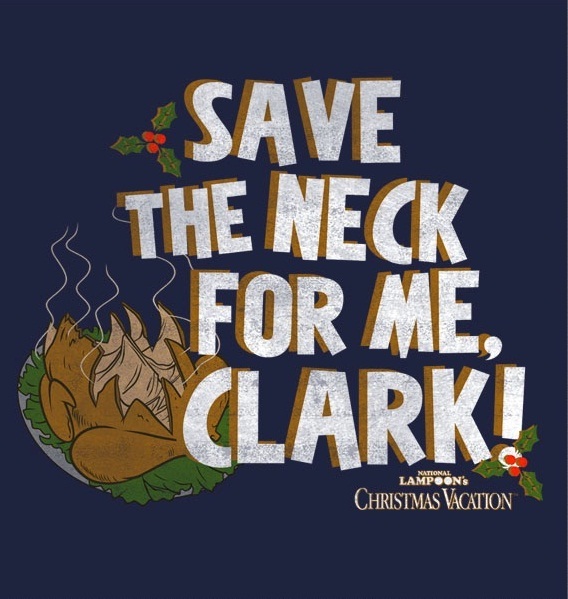 Bonus points if you did! A trick I learned from the same person I got this recipe from is to use Lawry’s to finish the eggs instead of paprika. There’s something about the seasoned salt that brings all the flavors together. Yum! Cover the eggs and refrigerate for 2-3 hours (overnight is better). This gives the ingredients time to meld and the flavors to blend. Enjoy! *I don’t always use dried minced onion, but when I was digging in the pantry for an onion, there was only one left and it was half rotted. Minced onion makes a good substitute, just make sure you re-hydrate in warm water before adding to the yolk mixture. Spain is the birthplace of bullfighting, foam parties, and today’s food holiday. It’s National Paella Day! Paella – Spanish for “pan” – was invented by Spanish peasants, who would gather the cheapest ingredients they could find, throw them together in a big pan, and cook them over an open fire. Traditionally, this included chicken, duck, rabbit, and snails. When the meal was ready, laborers would gather ’round the pan and eat from it directly using long, wooden spoons. After awhile, the Spanish were like, “Wait a minute…why are we eating snails when there’s a bounty of seafood available off the coast? What are we, French? !” The recipe evolved to include rice, beans, spices, tomato, and seafood. Mixed paella – incorporating both meat and seafood, along with fresh vegetables, and flavored with saffron – became the norm, and is considered Spain’s signature dish. It is a popular custom to cook great, big pans of paella at festivals and other public gatherings in Spain. Chefs use enormous paelleras (specialized paella pans) to cook and feed the masses. 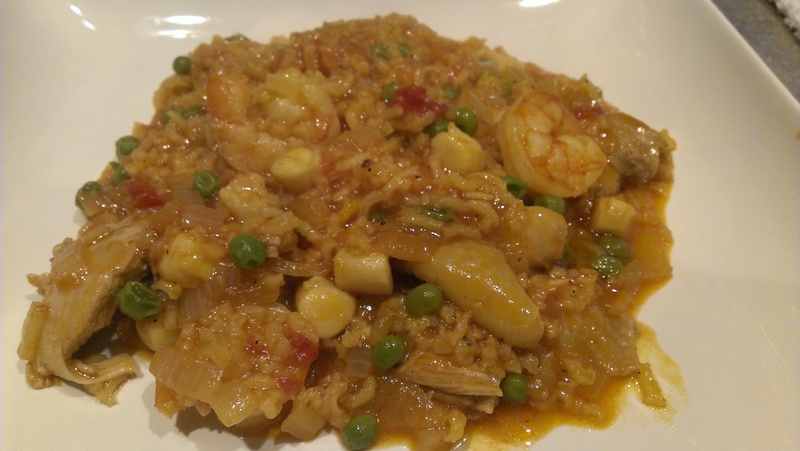 Paella was one of those dishes that looked intimidating when we skimmed over the food holidays before kicking off this challenge. My only experience with the dish was a quick reference to it in a Seinfeld episode. The exchange was brief but memorable. GEORGE: Ok, fine. It’s going to be very interesting, very interesting if they don’t show up tonight. You know my mother made all this Paella. JERRY: What is that anyway? GEORGE: It’s a Spanish dish. It’s a mélange of fish, and meat with rice. Very tasty. So, with that basic bit of information to go on, I researched recipes – and discovered you can add just about anything to a paella. There were hundreds of recipes to choose from, but I decided to freestyle-it and adapt my own recipe from one I found. The essential ingredients were the same: rice, saffron, chicken, and seafood. From there I could get creative, and that’s exactly what I did. After work I stopped by the grocery store and bought shrimp and scallops. I couldn’t get clams though, and the reason is bizarre and sad. The seafood monger told me their clam supplier in Alaska suffered a tragedy recently: a boat sank killing every crew member but one, and the lone survivor refused to go out clamming anymore (smart dude) – so Fred Meyer is fresh out of clams. A moment of silence for the lost clammers, please. As for the paella? It sure looks good in this picture. There was a lot of work involved, and I think it could have benefited from a few changes – more seasoning, the addition of some chorizo, etc. But all in all, it wasn’t bad. Just a lot of work for a Wednesday evening. And one of our more expensive dishes: the tiny jar of saffron alone cost $10. 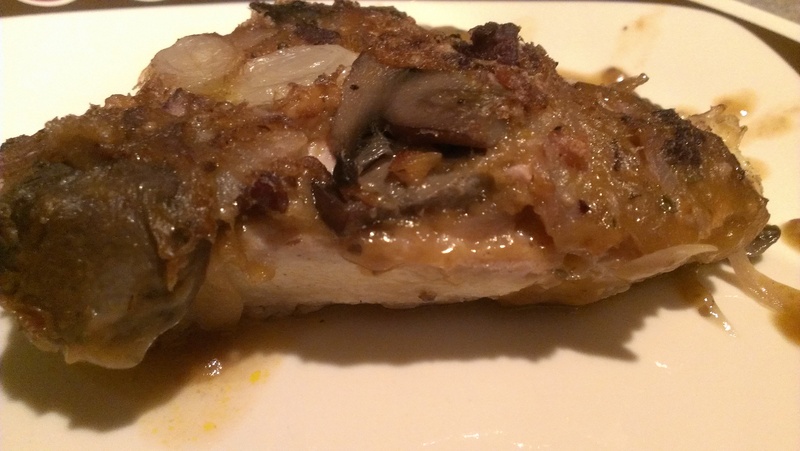 Plus the seafood, chicken, etc….